Accely has a deep under- standing of the publishing industry. Effectively, we help publishers to determine the right digital business model and optimize future revenue growth through a multi- platform approach. The publishing industry today is challenging. The competition landscape is changing and new, aggressive players are emerging. Publishers need to focus on building and delivering a strong, recognizable brand and to not give their customers away to their channel. In addition, as growth has slowed and with lagging digital monetization, the industry has faced pressure to reduce cost of materials, SG&A, back office expenses and to find new ways to drive future value. Accely always marries leading-edge technologies with a deep understanding of the industry. Accely has developed a full set of solutions to help a publisher’s business— from content ingestion and cash collection through to customer interaction. The print and publishing industry has undergone a dramatic change due to the digital media revolution. There has been a noted push to move from newsprint to the web even as the publishing industry at large is becoming digitized. With the emergence of smart phones and next generation devices like the iPad, it is becoming more and more common for publishing works to be accessed digitally. Inability to monetize the print publishing assets for multi channel distribution. Increasing demand for flexible and sophisticated subscription management solution. 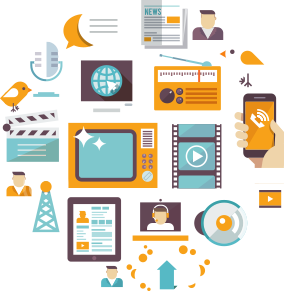 Multiple content formats, distribution, editorial and advertising publishing workflows. Inadequate digital asset management systems for production and marketing assets. Digital content files, delivered from many sources in various formats, are growing in size and complexity. This increases the challenge of managing and searching multimedia content. We provide integrated solutions portfolio and partner ecosystem. Our experience can help transform your publishing value chain. Presently, we are working with three top global publishers. Increase customer base and enhance customer experience through new media solutions, delivering their content to the web, mobile, etc. Increase “Return on Content” by streamlining the content and enterprise business landscape across the pre-press, content management and distribution processes. Reduce cost and content delivery cycle time across publishing life cycle through re-usable solution patterns and productized frameworks.